My children love a warm breakfast and while I love the idea of preparing them a warm meal before school everyday, the reality is I need a little time and some coffee before whipping out my bowls or griddle and getting to work. This means on some days it is an easy breakfast – cereal, whole grain bagels, yogurt – the kind of breakfasts that require minimal effort. When I ran across this recipe about a year ago, and dozens of variations of it since, I was instantly intrigued. Easy enough and it gives my kiddos and myself a hearty breakfast and time. Sold! I have adapted the original recipe over time to make the nutritional profile a wee bit healthier. Keep playing with the recipe and add in your favorite ingredients too! Tip: Choose sweet apples, like Gala or Fuji, to add flavor and natural sweetness. Steel-cut oats are essential grains, which are full of nutritional value, rich in B-vitamins, calcium, protein and soluble fiber while low in sodium and unsaturated fat. Soluble fiber can help reduce cholesterol and also helps to keep blood sugar levels steadier. Toppings: Greek yogurt and almond milk mix (as pictured), raisins, chopped nuts, milk, granola, etc. Adapted from The Yummy Life. Spray the insert of a crockpot with non-stick cooking spray (do not miss this step as it will yield lots of soaking and scrubbing and possibly many unrepeatable words). Add all the ingredients (minus toppings) to the slow cooker and stir gently until well combined. 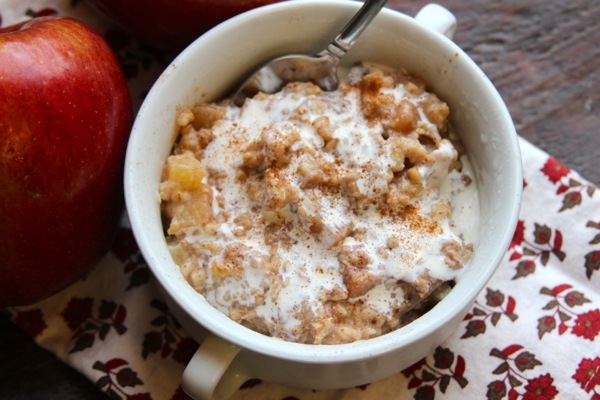 Uncover, give the oatmeal a quick little stir and serve with additional toppings if desired.